When you call us, you’ll be speaking to a small team of experts that have been working with clients on the Gold Coast since 1996. 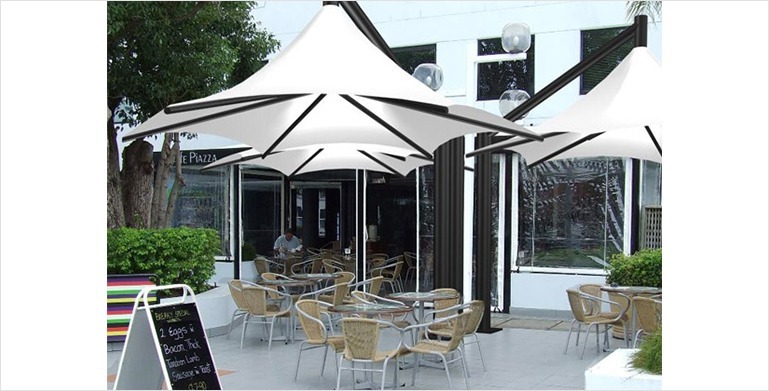 We have constructed many different types of applications using shade sails for many local for residential and commercial clients including some commercial landmarks that you may be familiar with. Every shade installation begins with Anthony visiting your site to discuss with you what you need and what you’re looking to achieve. We’ll advise you on suitable options for materials and help you select the right colour and style and make sure that you’re happy with the design. If your shade sail requires a post, we will install that first. You don’t need to be there so if you have commitments you can go about them while we install the post. We’re responsible and reliable, we won’t leave you sitting around waiting for us to show up and we’ll make sure we lock the gate or door when leave. Once the post is up we’ll need to take measurements from the fixing points so that the sail or umbrella can manufactured to the exact measurements required. Once the manufacturing has been completed we’ll return to do the shade installation. Don’t just think about a shade installation – call us! We’ll arrange with you a suitable time to come out and do a free measure and quote. Our expert will also inspect the area where you want the shade installation to be. The quote we give you will be broken up into 3 payments, 25% deposit for manufacture of steel component & fittings points, 50 % progress payment for installation of steels components, 25% balance on installation of sails and completion of project. Once you’re happy with the design we’ll be able to go ahead with manufacturing and then arrange a suitable time to come out and do the installation. Once installed all we need to do is we will adjust the tension in the sails. As well as new installations, we offer servicing and re-tensioning for shade sails. As soon as your shade sail is up, you can relax and enjoy your newly shaded area!